The first two days of February have since ancient times been celebrated as a midwinter sacred festival in honour of the upcoming return of the Sun. This is the decisive time of midwifery, when the divine mother enters into the final gestation for spring. The term Candlemas comes from the tradition of the Roman Missal where the celebrant of the Mass on 2 February blesses the beeswax candles for use during the year. According to ordinary history candles have been used for more than 5000 years and were first developed by the Egyptians, although the Romans are credited with introducing wicks. The name candle comes from the Latin candere, which means “to shine”. Candlemas is an ideal time for reawakening our capacity to shine who we truly are in the separated darkness of this world. “Wake up sleeper. Rise from the dead. Let the Christ enlighten you.” teaches the Gnostic Paul, summing up the core message of Christianity, which implies releasing our dormant identities based on separation and resurrecting our united luminous nature. Blessing candles on this day can be an empowering ceremony to exemplify this process and to remind it throughout the year, whenever those candles are used. Candlemas commemorates the Purification of the Virgin Mary and the presentation of the infant Jesus in the Temple 40 days after his birth. It is the Christianised version of the Pagan celebration of Imbolc. Imbolc means, literally, “in the belly” (of the Mother), “in milk” or “milk wolf”. This festival marked the mid-way point between the Winter Solstice and the Spring Equinox, and was celebrated with lights so as to accelerate the coming of spring. Although darkness was still prevalent in the sky, light gradually unveiled and needed encouragement to finally triumph. In the Pagan tradition Cernunnos, the Horned God, was the virile male deity ruling darkness. 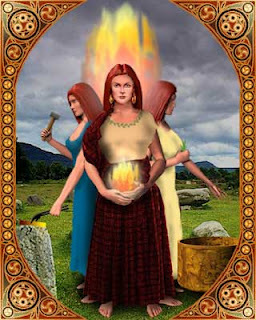 Imbolc represented the impregnation of the feminine deity by the masculine. The God of Darkness lit up his abode with candles to welcome the Goddess of Light and impregnate her. Light and Darkness are two inseparable polarities, who play their loving dance through the cycle of the year. 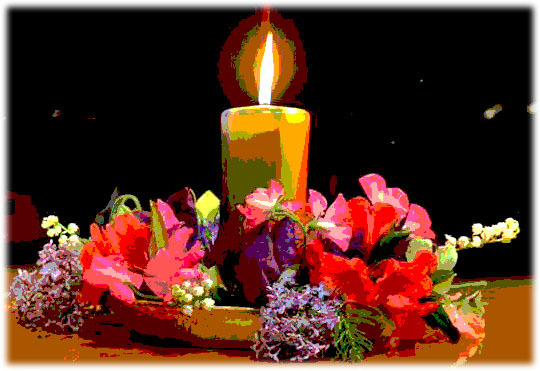 Candles are sacred instruments for awareness and soul retrieval. Their light requires darkness in order to be seen, just as awareness and visibility are sustained by a background of unconscious and unseen reality. Blessing and using candles is a way to celebrate the light and to honour the dark roots of the path towards illumination. In the lunation cycle Candlemas is associated with the Crescent Moon, corresponding to 3 am in the daily cycle. In the United States and Canada, Candlemas evolved into Groundhog Day celebrated on the same date. Candlemas is often a reference for predicting the weather for the coming year. An old British rhyme tells that “if Candlemas Day be bright and clear, there’ll be two winters in the year”. Another custom is weaving “Brigit’s crosses” from straw or wheat to hang around the house for protection, performing rituals of cleansing and purification, placing a lighted candle in each window of the house for a whole day, and obviously making candles. In ancient Greece the beginning of February was also the time of the Lesser Eleusinian Mysteries or Festival of the Returning Daughter: an initiation into the lower mysteries, which unlike the Greater Eleusinian was open to many people. For both Celtic and Roman cultures, February was a period of physical and spiritual purification and initiation. During the mid-month Roman celebration of Lupercalia priests of the god Pan dressed in goatskin and carried thongs with which they whacked young women to make them fertile. Young half-naked men also ran around the Palatine Hill and Rome, and lashed young women with strips of skin from a slaughtered goat. The women appeared to appreciate the attention and often stripped in order to afford better targets. This was considered to bring fertility and good luck. 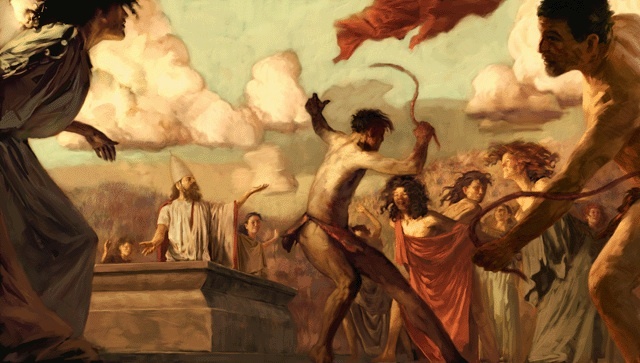 The Lupercalia was a celebration of sensuality and one of the most popular festivals in Rome. From the Lupercalia and the earlier Saturnalia come the celebrations of Carnival typical of Catholic countries. February comes from the Latin februa, literally “tools of purification”. In ancient Roman times the term februa indicated a large variety of purification implements, such as the clothes used to asperse the blood of sacrificial victims, the toasted spelt focaccia salty buns held by the priest during the purification of homes, and whatever was employed for purification purposes. From februa comes the verb februare, “to purify”. Februus was also the Roman god of purification. February unveils the arbitrary nature of human time and is a multidimensional setting par excellence, It is the shortest month and the only month with 28 or 29 days. The month has 29 days in leap years, when the year number is divisible by four, except for years that are divisible by 100 and not by 400! In other years the month has 28 days. 2012 is a leap year. February is about shape-shifting, unbridled freedom, and reversal of social customs, as exemplified by the Carnival celebrations. This makes it an ideal month for exploring alternative configurations, working with out of the ordinary reality or simply moving out of daily routine and doing something absolutely unpredictable or atypical. February, and the sign of Aquarius, exemplifies the Heyoka spirit. A Heyoka or Contrary is someone who does everything backwards. For example, instead of saying “Hello!”, he says “Good-bye!”. He chants songs in a reverse order and before eating makes his hands dirty. These people upset consensus reality and smash down its barriers. Their presence serves to remind us to stay in the present and not to take our human setting for granted. Their capricious behaviour causes shocks and shifts in awareness that unveil gaps in the ordinary mind, thus making it possible to open up to new lessons. According to the Lakota tradition, the Heyoka are amazing people who have received a special initiation involving great powers and commitment. This often involves hiding their major spiritual powers under a false facade of shyness or foolishness. Similar sacred obligations, which were once common in many traditions, are now carried out by some wise teachers in disguise who can hardly ever be acknowledged in the ordinary reality. These people do not exhibit their talents and are not concerned with ordinary achievements or recognition. They operate behind the scenes and are often the true teachers or inspirational sources of many popular spiritual authorities. Please find below a scene from the movie Little Big Man (1970), where a Heyoka is featured.